Gustavo Capanema Palace, home to the Rio de Janeiro office of Brazil’s Ministry of Culture, is no Versailles. It was created in the image of the Brazilian people, bearing the socialistic influences of figures like the painter Cândido Portinari and architect Oscar Niemeyer and recognised globally as a leading example of the unique Tropical Modernism style. In Brazil’s arts community in particular the building is remembered as a site of artistic sustenance during the years of dictatorship between 1964 and 1985, a period which saw prominent (and heavily sanctioned) resistance from world famous cultural figures such as Gilberto Gil and Caetano Veloso. As Brazil faces another move on its democracy in the form of a not popularly elected President, Michel Temer, artists are again showing their colours. 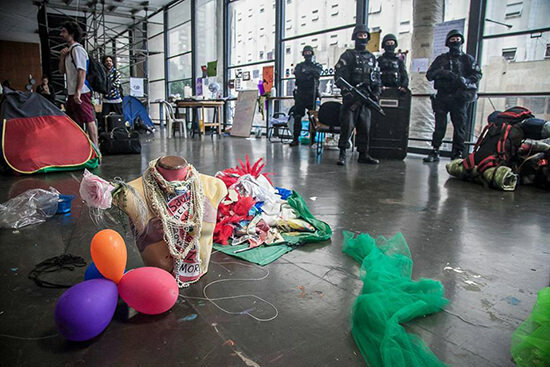 This time it’s in the performative shape of Ocupa MinC (Occupy Ministry of Culture), the movement that has seen Ministry of Culture buildings occupied in 22 of 26 states across Brazil in a deeply embodied response by Brazil’s classe artística to the illegitimate removal of former President Dilma Rousseff by Temer and his right-wing cronies. In Rio de Janeiro, Ocupa MinC has animated the Gustavo Capanema Palace for over 60 days, brightening Rio’s downtown government and consular district with anti-Temer graffiti, colourful banners, makeshift shelters and music and conversation running late into the night. The occupation is in operation across three floors of the building and reflects the organised logistics and aesthetics of opposition that the world came to know during the days of Occupy Wall Street: tents, hand-crafted signs, a communications centre, a communal kitchen, spaces for relaxation, a women’s space, a queer space. That the building is currently undergoing renovations adds an extra layer of provisionality and anticipation to the visual effects of this political performance: furniture covered in tarpaulins and masking tape, artworks cordoned off with signs that warn against touching them, the building’s facade dominated by tradespeople and scaffolding as well as the canvasses and graffiti of the occupiers. The building is still operational as an arts bureaucracy, and the public servants who come there to work every day are largely supportive of the occupiers, agreeing that the country has undergone a coup d’etat and that the resistance of the cultural sector is vital. In its day-to-day operations, Ocupa MinC is careful not to extend any of the resources already in use by the building’s workers (including electricity for the lights, which gives my photographs a mellow haze), and prides itself on keeping the floors clean and the cultural patrimony intact. The stakes of losing the Ministry were high for Falci and his colleagues. 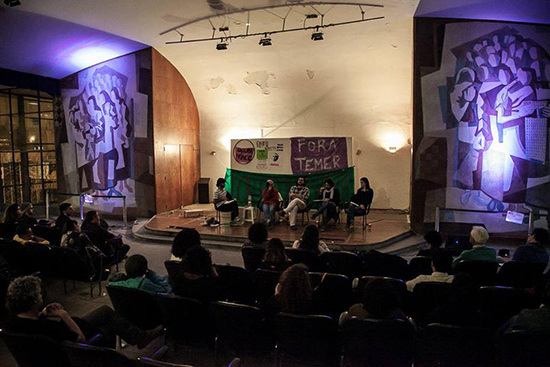 Government support and funding for culture-making was hard-won in post-dictatorship Brazil and the community is not willing to let it go quietly. Under the government of Rousseff’s predecessor and mentor “Lula” (Luiz Inacio Lula da Silva), artists who had been targeted by the dictatorship found space to flourish, with Gilberto Gil, for example, serving as Minister for Culture. One of Gil’s best-loved innovations as Minister was the Pontos de Cultura (Points of Culture) program, where any group who could make a claim to be producing culture in Brazil could apply for government funding to do so. “We have made a Ponto de Cultura here!” notes Bruno, and he’s right. As a visitor to Rio I have already attended concerts and debates at the site, taken photographs, found lively and thoughtful conversation, often in English and Spanish as well as Portuguese. Free performances, talks, dances and debates are held every evening, organised through social media and attended by people from all over the city. Events have included a panel discussion with radical geographers Ananya Roy, Oren Yiftachel and Ken Salo; and a concert featuring composer, singer and activist Caetano Veloso and singer, songwriter and actor Seu Jorge. Most of the other occupations across Brazil have been disbanded under threat of prosecution, but Rio’s Culture directorate has had more flux than some (indeed, as Bruno tells me, nobody seems to want the director’s job at the moment, and negotiations with the occupiers have been handed over to the national department for cultural heritage while the state challenges their presence in the courts). When I visit in late July, the impending Olympics and its aesthetic concerns seem to have created some urgency among the authorities about removing the occupation, but it remains unclear whether efforts to disband them will succeed. 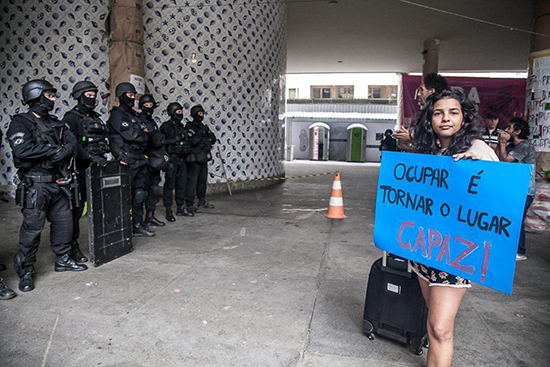 In keeping with the philosophy of Occupy across the world, the performativity of Ocupa MinC is key to its power. “We are using a public space for the public,” says Bruno, as he guides me in fading light to a Cândido Portinari (1903-62) wall painting in the Palace’s auditorium. “This is controversial because the public space wasn’t quite public before.” Indeed, in a speech made during his time as Minister for Culture, Gilberto Gil laid out his vision of creating an “unparalleled infrastructure for public visitation” of the building, with respect to its particular cultural heritage, referring to “the commons that impel the construction of public policy, here in its cultural expression”—allowing “the city of Rio de Janeiro… access to itself” (Gilberto Gil, “In Praise of a Modernist Monument,” The Rio de Janeiro Reader, Duke University Press, 2015). In this sense, Ocupa MinC feels less like the “invasion” it has been called by the authorities and more like the fulfilment of a promise. As my eyes adjust to the Portinari painting, I realise it depicts the Palace being carried by the people.